Aces & Eights Video Poker is an American styled video poker variant developed by RTG that offers payouts for the addition of extra four of a kind hand combination. It offers a total of twenty-two possible hand combination and does not include any special cards that will act as a wild or multiplier. Realtime Gaming’s Aces & Eights video poker is part of the RTG video poker library. It features traditional poker hand combinations and has the added advantage of payouts for any four of a kind combination. The minimum payout is for jacks or better and the Royal Flush is the highest winning combination achievable. If you are looking for a trusted software to play video poker, you can trust that RTG will meet your needs when it comes to reliability and fair gaming. While this review is based on Aces and Eights, it is one of seventeen different video poker variants that can be played with RTG casinos. Every variant of video poker has its own unique advantage, and in Aces and Eights, it is the added wins that can be achieved through any combination that has four of the same cards in a hand combination. HOW TO PLAY Aces & Eights Video Poker? In Aces and Eights, eleven standard hand combinations will award wins based on the paytable that is located above the playing area. However, with the addition of the extra four of a kind wins that number increases to 22 as wins will be awarded for four of a kind combinations of two through six, nine, ten, jacks, queens and kings. To commence gameplay, select the denomination you wish to wager, the number of coins you wish to play per hand and then click on the deal button. Cards will be dealt face-up and can result in winning combination. After the cards have been dealt, you will have the option to choose which cards you wish to hold, and which you wish to be re-dealt with the hopes of improving the hand dealt. The lowest paying hand combination is jacks or better; this is traditional with most variants of video poker. Following jacks or better, two pair, three of a kind and a straight will result in a win. A flush, full house, “other” four of kinds, four of a kind sevens and four of a kind aces or eights will award wins of two coins to 400 coins. The number of coins won will depend on the number of wagered coins. Finally, a straight flush and a Royal Flush complete the available possible hand combinations. A straight flush offers payouts ranging from 50 coins to 250, and a Royal Flush, the largest paying hand combination awards between 250 to 4000 coins. As you can see from the range of coin wins, the best strategy is to play max coins, even if that requires you to adjust the coin size to make it affordable for your bankroll. Aces and Eights does not offer any in-game features that will impact the outcome of any dealt hand. All game controls are conveniently located under the playing area and buttons relating to the coins to be wagers, a max bet button, a bet one button and a cash out button. 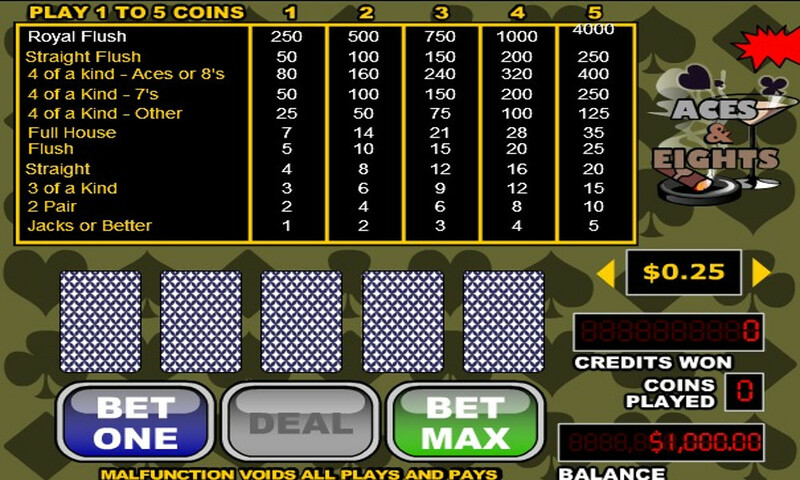 Aces and Eights covers all the basis when it comes to a well-designed video poker game. RTG did a fine job with creating a poker game that’s been time defying and one of the long term popular choices for players around the globe. The payouts meet expected payout amounts, and gameplay is smooth, efficient, and for those new to video poker, it is easy to learn and allows you to quickly understand different ways to play strategically to increase your overall winning percentage. This is a simple version and graphically, not much can be said. It would be nice to see RTG update the look of this game to give it a more modern feel, but for many, classic styled games are sought after, still, a refreshed look might draw more to realize the power video poker can deliever. Players, we need your help with how we should to rank and rate these reviewed casino games. You can help us by rating this game, and if you really enjoyed playing Aces & Eights Video Poker. You can also share it with your friends on Facebook, Twitter and via email. For all freeplay games, if your free credits run out, simply just refresh the page and your balance will be restored. See all of our Video Poker game reviews where you can play 15 video poker games for real money in any of our recommended casino sites.